This mystery focusses on the impacts of tourism in Cancun, Mexico. Pupils need to investigate the reasons why Emilio can't use the beach in Cancun. This avatar introduces the mystery to pupils and sets the scene ready for their investigation. This mystery focusses on the impacts of tourism in Cancun, Mexico. 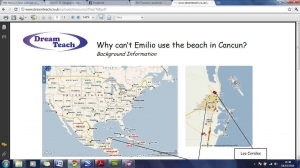 Pupils need to investigate the reasons why Emilio can't use the beach in Cancun. This file is the clue cards. This mystery focusses on the impacts of tourism in Cancun, Mexico. Pupils need to investigate the reasons why Emilio can't use the beach in Cancun. This file is the background information sheet.